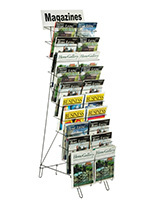 These Magazine Holders Ensure that Printed Materials are Readily Accessible to Customers! Now Maintaining an Orderly Shop is Easier than Ever! 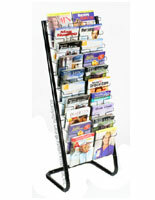 These Magazine Holders with Open-Faced Racks are Finished in Black! 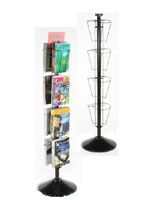 These magazine holders are ideal for saving retail floor space in limited locations. 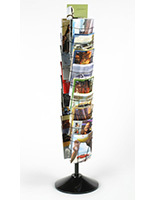 The retail stands are equipped with (20) full-face pockets that allow for a full view of the various publications. The magazine holders have two pockets on each of the (10) rows. 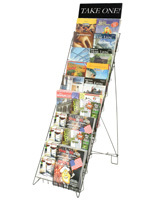 This way, all kinds of catalogs, periodicals, and magazines can be displayed with ease. Each row of the magazine holders measures 1" deep. For this reason, the quantities that can actually be displayed depend largely on the thickness of the publications. 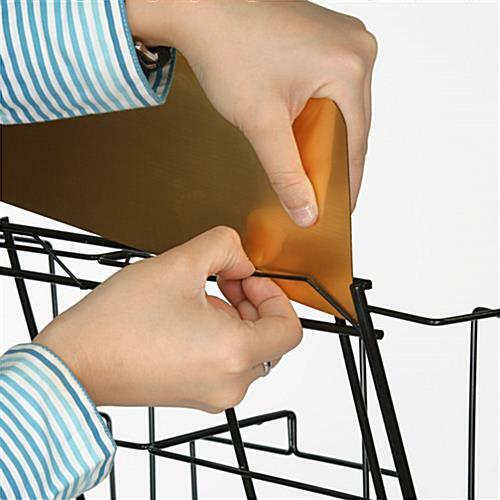 At the top of the racks there is a signage header that allows users to customize the displays. The depicted magazine holders show a "Home Improvement Magazines" sign, which is a great example of how the header might be used effectively. 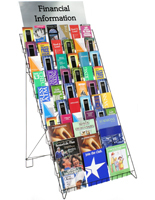 The display stands are very noticeable sales tools. 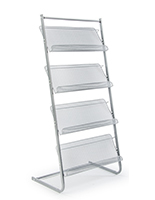 Merchandise racks like these are frequently observed in pharmacies, gift shops, supermarkets, and other retail outfits. The publication stands are also quite portable, as they fold up for simple storage and transport. 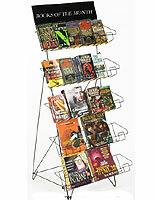 The magazine holders, also known as literature racks, are built using lightweight welded wire to withstand extended use. 18.5" x 51.5" x 21.8"
9.3" x 8.8" x 0.75"